As mentioned here last week, I was on the scene at Marine Corps Base Quantico, Va., for Marine Corps Times as the course’s initial Combat Endurance Test took place. It’s an assignment that had us pushing through the forests of Quantico for hours, observing lieutenants as they endured one of the hardest days of their lives. As the cover image above shows, the course is of significant interest now because female volunteers are attending it as part of the Marine Corps’ ongoing research into which assignments women should have in combat. I spent significant time observing the two women who stepped forward to try IOC this time around, and cover it in detail in this week’s cover story. The story also goes behind the scenes at IOC in a way media rarely reaches. We were allowed to watch salty speeches that instructors gave students, the grueling stages of the endurance test and the hard work that occurs long before the sun rises. To check out the story, pick up this week’s Marine Corps Times. The story is also available online via Marine Corps Times Prime here. If there are female Marines that can make it thru the IOC and in any combat MOS, I say “good for you!” I do not, however, feel that the entire female population in the Marine Corps needs to lose their gender because there are a few who feel they can endure what male Marines endure in combat MOS’. I have been a Marine since 1987. I will be the first to say that I will do what the Commandant tells me to do because I am a professional, however, I am also a woman. I was taught from bootcamp that although I am a Marine, I am still required to act like a lady. Men and Women are different. We are built differently, our muscle mass is different and the one significant difference is that as men get older, they grow stronger in their upper body strength. As women get older, we are weaker in our upper body strength. How is it that female Marines now need to do pull ups, yet the scoring is the same for all ages? The fact that our PFT has now changed to adjust to the male PFT is wrong in itself. Its changed because we have some male Marines who are crying that “it’s not fair!” “It’s different from our PFT! !” That’s right, it is different, because we “ARE” different. Now with the 2 changes to the female PFT, the changes to the barracks cover coming and now, talk of all of us wearing the same dress blues (i.e. the male version of the dress blues), I can’t help but think that the Marine Corps is either trying to weed the females out of the Marine Corps OR trying to turn us into men. One Marine I spoke to said that the reason they are changing us into men is because if we all look at each other as men, there wont be any sexual assaults. In my opinion, we need to be allowed to be the women that we are. I don’t want to be a man. I don’t want to have a HUGE back like a man trying to do pull ups or wear their dress blues or their barracks cover….what is so wrong with us being women? I believe that all MOS’ should be open to everyone. If a female wants to try out to be a grunt, let her. If she fails, she fails. If she passes, she passes. I don’t want every other woman, to be forced to be a male because a few feel that they can be grunts. Additionally, what will happen to a stellar female Marine who has had a great career, and now she can’t do pull-ups? Will her career be over? Will she now get an adverse fitness report and be kicked out? On top of that, male Marines had years and years of kipping on their pull ups. 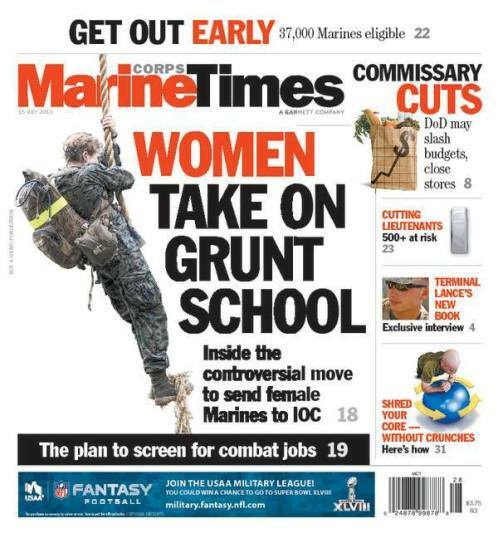 Now, all of a sudden, female Marines are expected to go from doing none at all to full dead hang pull-ups and no kipping…….really?? It’s a wonder why no one has gone and filed a complaint about this branch of service trying to turn females into males. That is essentially what is happening…. I have respect for your comment, and I will agree on the PFT to an extent. Females should be given a certain “adjustment” period in which they cannot be reprimanded or have it held against for not being able to do pull-ups. However, you chose to join the Marines. You chose an occupation that under specific circumstances allows you to take someones life in the service of your country. NOTHING about that is either manly or lady-like. However, every Marine is a rifleman. You are supposed to be basic infantry. There is a certain amount of physical strength that comes with that obligation. Female Marines finally won the gender battle of just being allowed to enter combat MOS’ as long as they meet the physical requirements. In my honest opinion though, there never should have been a double standard in the first place for any MOS, male or female. If you want to be a Marine, step up to the challenge. Genetics might say that the average woman does not have as much upper body strength as the average man. But last I checked there are nearly no limits to the strength ANYONE can achieve in any muscle group so long as it is worked at. BTW, it took me 3 years to get from 3 pull-ups to 20. When I could only do 3 pull-ups I could still hold myself above the bar 3 times longer than the females PFT perfect score. Whats the fairness in that? I’m with Bobbie. There should have never been a double standard for PT…for any service or MOS. Either man or woman, both should be held to the same reps/minute and run times. Combat is indiscriminate. All military service members sign up knowing that they could face just that – life or death combat. So if that ever came up, they should all be able to do the same thing as one another.